The Washington State clinic comments on a recent article that there are numerous ways to effectively treat visible veins. Enlarged veins are usually unattractive and often itchy or painful, as well. Active measures are necessary to permanently treat visible veins, and, fortunately, there are more choices and options than ever before. A November 9 article in Self magazine offers advice to readers on the steps that can be taken to defeat unsightly – and often itchy or painful – varicose and spider veins. The articles notes that, while such measures as massages and dry skin brushing might temporarily make one feel better, they have not been shown to have a permanent impact on actually improving enlarged vein issues. Moreover, steps such as compression socks can ease discomfort and may help to prevent additional enlarged veins later on, but they do not actually correct the enlarged veins that are already present. Washington State clinic Northwest Vein & Aesthetic Center says that the article highlights the fact that active measures are necessary to permanently treat visible veins, and, fortunately, there are more choices and options than ever before. Not long ago, the only effective treatment for varicose and spider veins was a larger surgical procedure referred to as “vein stripping,” says Northwest Vein & Aesthetic Center. While the name of the procedure caused a lot of concern amongst patients, the Center notes that it was reasonably effective. In more recent times, however, a new generation of far less invasive treatments has made vein stripping unnecessary. The clinic notes that the aim of these treatments is to find ways of causing veins to close off so that blood flow is redirected to healthy veins, relieving pressure and inflammation, and making veins “disappear.” Because the treatments are minimally invasive, the recovery time from this treatment is significantly shorter, and successful outcomes are extremely consistent. One of the most common forms of vein treatment today is sclerotherapy, the use of a medicated solution that is injected into an enlarged vein, causing it to close off; the clinic notes that many solutions are used and one proprietary solution goes under the brand name Varithena. 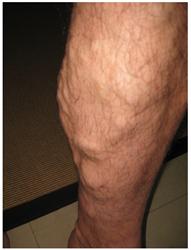 Northwest Vein & Aesthetic Center adds that there are several other forms of treatment available to today’s patients. Lasers, radiofrequency waves, a technique that combines mechanical and chemical energy called ClariVein, and an adhesive known as VenaSeal are among the most frequent alternatives. The Center adds that in addition to a number of less-invasive treatment options, there are also more choices when it comes to preventing discomfort. A combination of a local anesthetic and mild sedation is highly effective says the Center, but sometimes patients who are more nervous about the prospect of discomfort require more potent sedation. However, the Center adds that it provides an additional immersive virtual reality (VR) that helps patients relax and feel more comfortable by putting them in an extremely pleasant virtual environment. Northwest Vein & Aesthetic Center adds that, while varicose veins are not life-threatening, they are considered a medical problem which can become worse over time. It’s therefore always a good idea to have enlarged veins looked at by skilled vascular surgeon who can suggest types of treatment. If there is itching or discomfort, vein treatments are covered by most medical insurance, says the clinic. Readers who would like to learn more about Northwest Vein & Aesthetic Center can reach the clinic at (253) 948-4378. The center’s web site is at http://nwveins.com/. It has two Washington locations, in Olympia and Gig Harbor.